RMA Roofing are the industrial and commercial gutter lining and roofing system specialists incorporating a concrete gutter lining service for domestic properties. 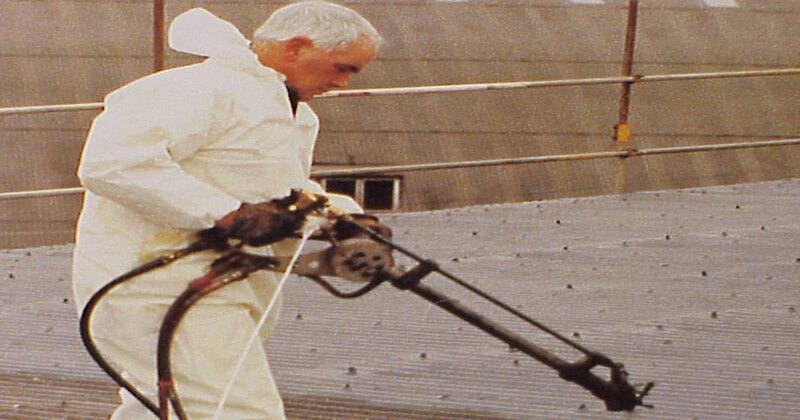 In 1973 we designed, manufactured and operated our unique RMA Spayed Membrane Process. The system was designed to form a seamless glass fibre roving reinforced membrane to any shape of roof structure or trough gutter. In the early 1970’s the system was used by the M.O.D. to seal leaking aircraft hangars, some of our treated hangars at what was then R.A.E. Farnborough are still standing today. We have designed and utilised spray systems for the simultaneous application of glass fibre rovings with modified polymer waterproofing materials. All our systems are unique and the result of a continual research and development program that not only creates new ideas in waterproofing technology but apply them on a day to day basis by staff who have a thorough understanding of what they are doing. Our expertise in the application of composite laminates to suitable roof and gutter structures is unrivalled. Following a long term extensive R&D Programme, we now offer our unique patented R.M.A. Solar Systems that are light years ahead of the competition. The new process has been formulated to be compatible with our old applications therefore saving existing clients significant savings in a further 10 year guaranteed waterproofing system. RMA Roofing have undertaken works for local council authorities including Portsmouth City Council, Slough City Council and Southampton City Council, who have used our systems to waterproof many large flat roofed housing blocks. RMA Roofing is the UK's leading industrial and commercial concrete gutter lining business. We have 30 years plus experience in the roofing industry. Contact our friendly sales team for help and advice about your roofing project.